“A sentencing hearing for the convicted preacher-clothes designer Tony Alamo is expected to conclude Thursday before U.S. Dist. Judge Jon McCalla. Former wives of Alamo called by government prosecutors testified that they were beaten and raped while part of his religious group. Child Abuse Hearing for Evangelist Delayed Crime: A prosecutor says convicted tax evader Tony Alamo should be denied bail because he had married 15-year-old girls. 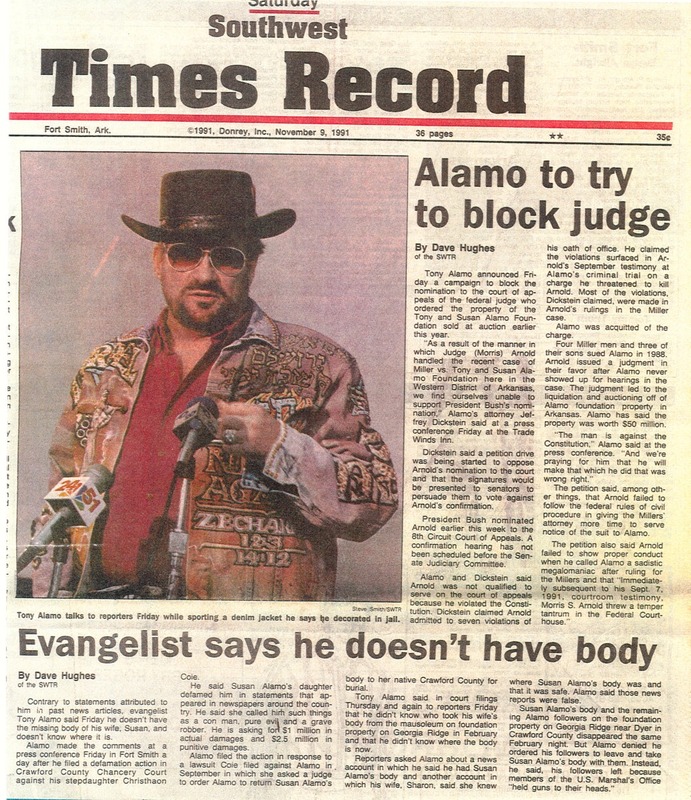 A Los Angeles hearing on child abuse charges was postponed Thursday for evangelist Tony Alamo, who remained in jail in Memphis, where a federal prosecutor accused him of marrying eight of his followers since 1993, including married women and 15-year-old girls. Alamo, 59, was convicted by a Memphis federal court jury Wednesday on tax charges. The marriage accusations were made by federal prosecutor Christopher Belcher as an argument against allowing him to go free on bail. The evangelist Tony Alamo has been convicted of tax evasion and jailed after prosecutors said that he was a risk to flee as well as a polygamist who had preyed on married women and girls in his congregation. I didn’t catch the show myself, but one interested viewer called with some thoughts about a segment of last week’s Unsolved Mysteries. It seems that a former Los Angeles street hustler named Tony Alamo, who had transformed himself into a religious cult figure in Arkansas, had disappeared owing the federal government $19 million. According to the TV show, the FBI and U.S. Marshals Service are looking for Alamo on tax evasion charges, as well as threatening a federal judge. DYER, Ark. – Resident John Chitwood said he thinks few in this town will be sad to see the Tony and Susan Alamo Foundation leave. “They wouldn’t even talk to us. They looked down on us,” he said of the group that calls itself a Christian foundation and is known for distributing anti-Catholic pamphlets. DYER, Ark. _ The guards who once kept outsiders away from the Alamo compound are long gone. 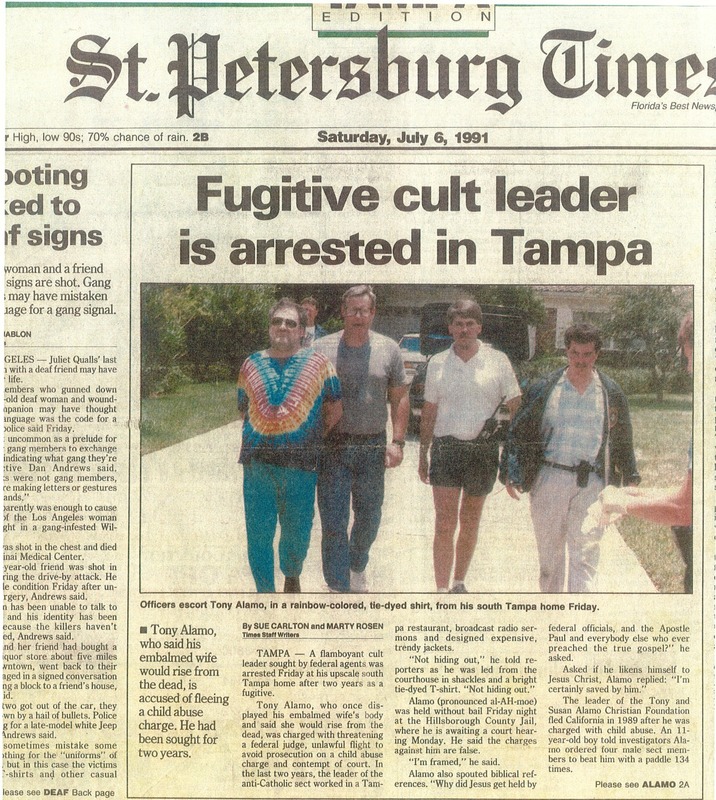 TAMPA — A flamboyant cult leader sought by federal agents was arrested Friday at his upscale south Tampa home after two years as a fugitive. Van Buren, Arkansas — Susan Alamo’s remains were placed in a crypt in Tulsa, putting to rest a years-long fight over the body. Mrs. Alamo, the wife of evangelist Tony Alamo, died of cancer in 1982. She was entombed Monday. The Arkansas Court of Appeals on Wednesday dismissed on a technicality religious cult leader Tony Alamo’s appeal of an order requiring him to produce the missing body of his long-dead wife for burial. 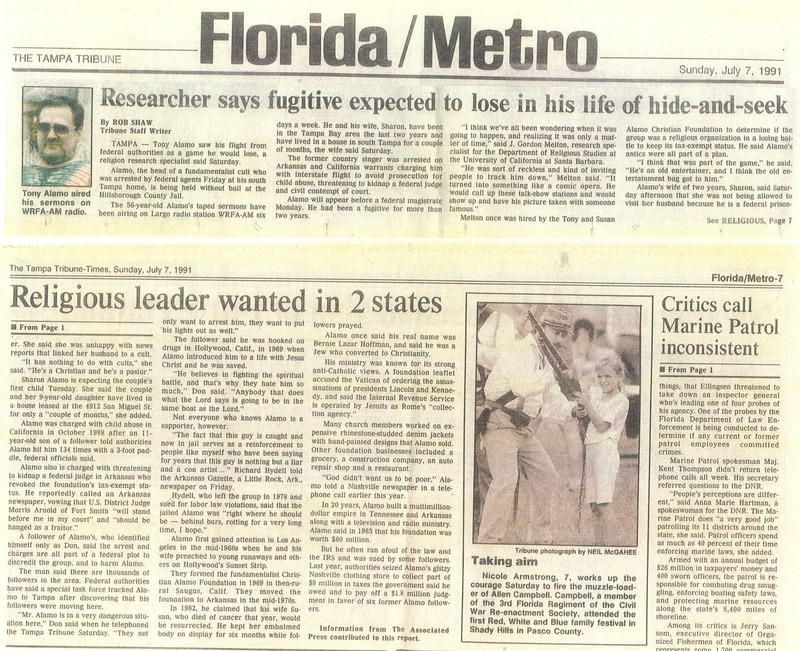 The body of Susan Alamo, who died of cancer in 1982, disappeared from a Dyer, Ark., mausoleum owned by the cult in 1991, shortly after federal authorities moved to seize church assets for tax irregularities. He’s a convicted tax evader and a flamboyant evangelist who once ran what authorities called a multimillion-dollar, Saugus-based cult. 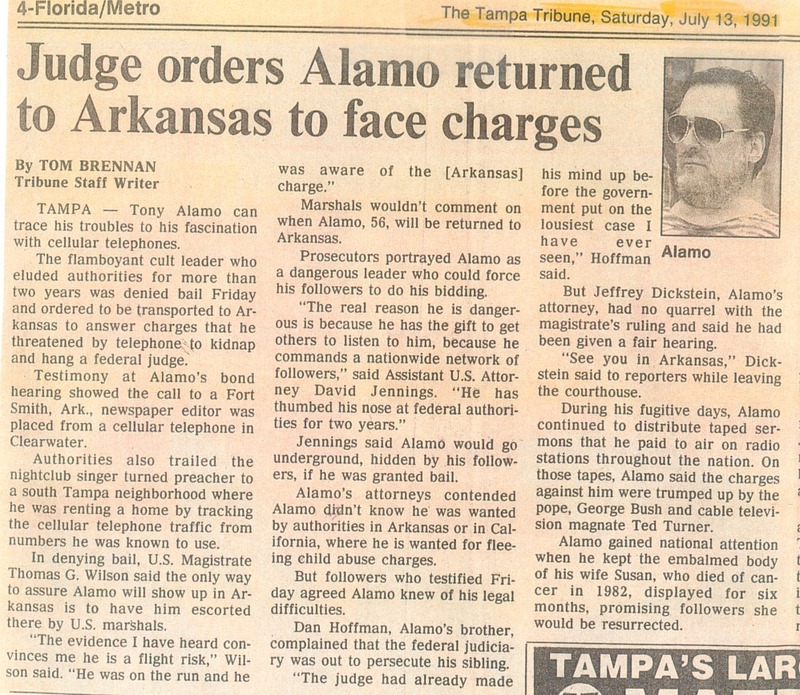 Now Tony Alamo is also a grave robber–at least in the eyes of an Arkansas judge, who has ordered him to lay to rest his wife’s missing 13-year-old corpse. 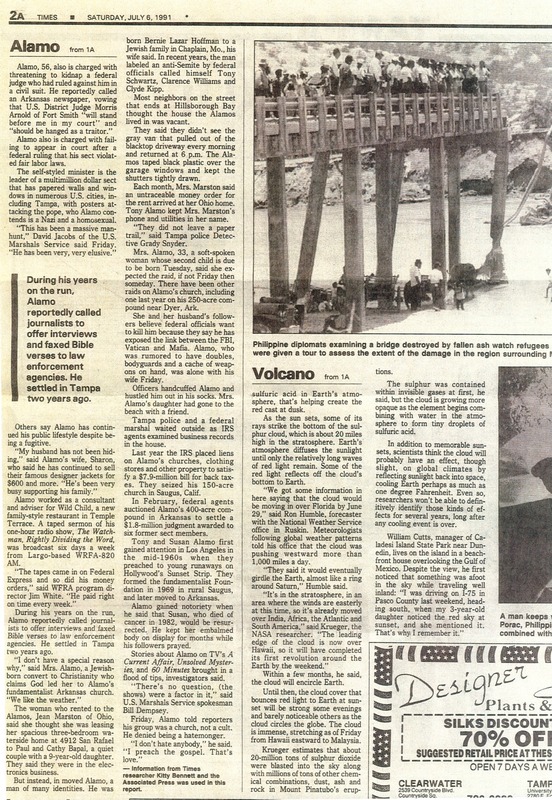 “It’s putting closure to it, finally,” said Alamo’s stepdaughter, Christhiaon Coie of Reseda, who sued Alamo literally over her mother’s dead body and for whom the legal decision represents a symbolic burial of her mother’s and her tortured past. Lawsuit: His stepdaughter accuses the religious figure of spiriting off the remains of his fourth wife. His countersuit claims he has been slandered. Call it a morbid sideshow, a strange offshoot to the ongoing tribulations of religious figure Tony Alamo. Arkansas: A court order had forbidden members from taking remains of Susan Alamo. Marshals had seized the property to pay off debts. The body of Susan Alamo, wife of fugitive cult leader Tony Alamo, was taken from a mausoleum on the cult’s compound in Arkansas after federal marshals had seized the property to satisfy a legal judgment, authorities said Tuesday.